Published by William S. Hein & Co., Inc. Throughout the month of February, the Harris County Law Library is featuring legal research and writing resources. Today's blog post highlights a resource that doesn't show you how to perform legal research but rather helps you find specific sources to get you the answers you need. 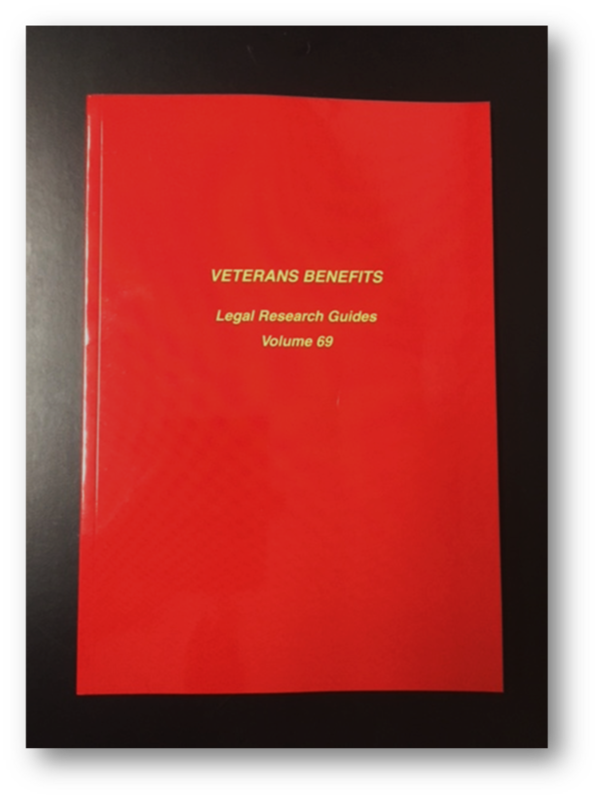 The 69th volume in a collection of research guides, Veterans Benefits: A Legal Research Guide provides researchers with a resource for locating benefits that available to veterans and their families. From the outset, author Lauren M. Collins stresses the need for a research strategy prior to embarking upon a search of this kind because of the difficulty involved with finding information regarding benefits. She notes that the most common resources available are secondary sources, specific federal statutes and laws, and relevant state laws and programs and provides some examples of each type of resource. She briefly explains the procedural steps for filing a claim for benefits and for filing an appeal should the request be denied. She also describes some benefits that are available for family members of veterans and some benefits that are provided by federal agencies other than the Department of Veterans Affairs and how to locate them. Ms. Collins also points out several internet resources, including government websites, websites maintained by advocacy groups, blogs, online training resources, and news alerts. Although not meant to be a comprehensive guide, Veterans Benefits: A Legal Research Guide provides some of the tools necessary to locate the benefits that veterans need and deserve. Stop by the Harris County Law Library to have a look at this vital research tool.